I know that people are always fascinated by sketchbooks. 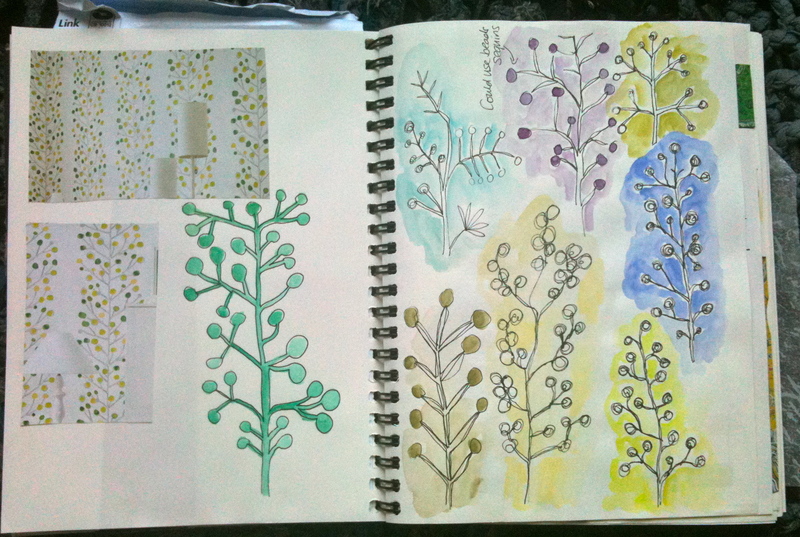 I make a cross between work books and sketchbooks which form records of my various projects. Here is an example. This one comes from a project on the Body Shop International and is for the mini-project on making shrines for the iconic products, in this case, carrot moisturiser. It is a slightly unusual sketchbook because it is made from an altered A-Z. This felt appropriate as the project contains a lot about pilgrimage. I have developed my own style of sketching which is to draw with a waterproof drawing pen in black or the very dark grey ones which are my favourite but which have virtually disappeared. Then I paint them with fantastic chunky water-soluble crayons, called ‘Neo art’ by Caran d’Arche, which I can only find in one shop, in Bristol. The minute that a watercolour wash goes over them they look instantly more professional. I carry a waterbrush with me which is a brush with a water barrel, which is really portable and doesn’t seem to upset museum guards. I occasionally use koh-i-nor solid dyes which come in a palette, and very occasionally brusho which I like but find a faff to make up for small bits of work. Most of this stuff can be obtained from Art Van Go (who also supply the wonderful Golden Fluid Acrylics which I drive people mad trying to track down here and in the US. They are really wonderful for painting on fabric. If I could have only one thing it would be a difficult choice between those and the watercolour crayons. All these things are expensive but so packed with pigment that they last for ages and so work out very reasonably in the long run). 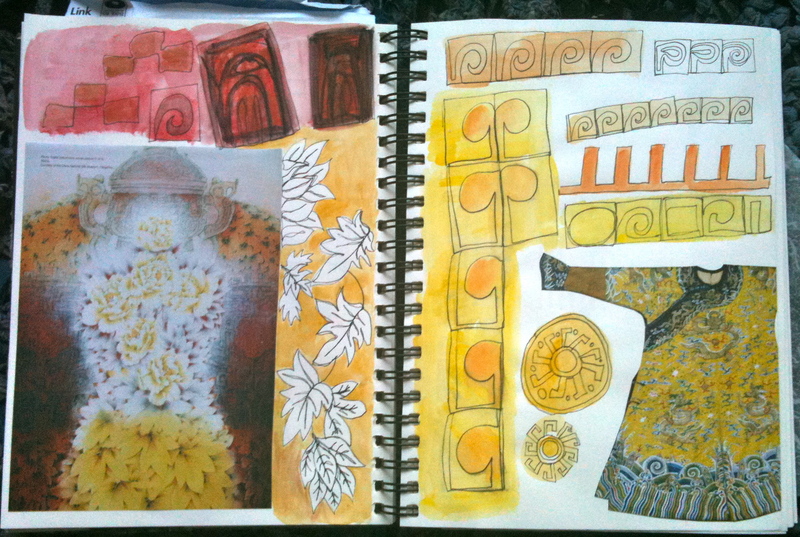 I will post more sketchbook pages in the blog. 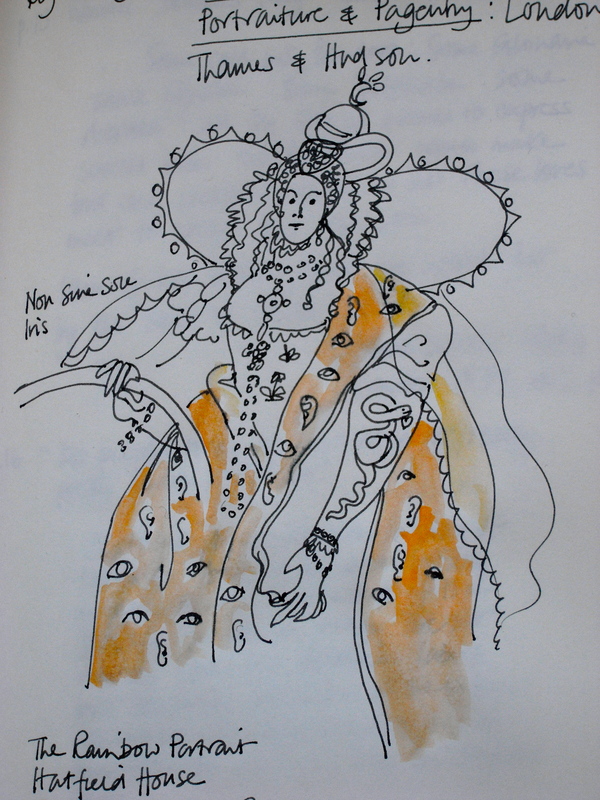 On thursday I went to the exhibition of Fashion and Identity with the Paperchase sketchbook (that in brown colour pages)… I was quite impressed by the things I saw and I made some little sketches… perhaps it is time to use your present (the watercolour crayons) I’ll let you know what will happen. I just found your blog today, love the textiles, the discussions and the context you provide in your posts. Thank you so much for leaving a comment. I didn’t realise that you could make up brusho and have it last. Thanks for mentioning that. Let me know what you think of Golden Fluid Acrylics. I think they are a joy to use and you never want to go back! I also looked up your exquisite blog. It is just gorgeous, and with such wonderful links. A real treat – like a new copy of Selvedge and a cup of tea! PS Liquitex is producing a liquid acrylic that’s incredibly pigmented. I found some for pennies in a local thrift store! Thanks for this = what a wonderful comment. It’s hard to believe when you finish something that you will forget it but you do! Thanks so much for taking the time to comment. I really appreciate the encouragement.